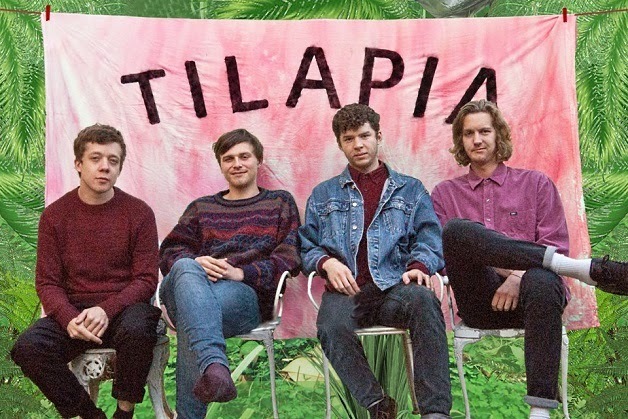 Today, we're spending Seven Questions In Heaven with Tilapia's Ed Allen. Our music is a little cheeky. We want to write music that packs a punch but also has a lighthearted melody running over it that we all like singing. We want each song to have its own little personality. My influences are Kevin Barnes from Of Montreal, Lou Reed, Dan Bejar from Destroyer, and The Beach Boys amongst others. I like a band to have something interesting in their lyrics, especially comical stuff like Yoni Wolf or Dan Bejar. Jens Lekman and the Magnetic Fields are really great for that as well. When those kind of bands make pop music it's just so engaging. Not too sure. Either Britney Spears Oops!... I Did It Again or Joseph And The Amazing Technicolor Dreamcoat musical mixtape. I was in a band called We Found The Fox years ago with some of the fellas from Bloody Knees. We did a gig in Grantham in a weird hall and then we got threatened with a baseball bat in the car park. Either that or at a house party with a swimming pool with the Mavericks Of Love (also one of my favorite gigs). The Sausage Cacao Schnitzel. Because i love sausages, cacao and my mum's German. Velvet Underground, Destroyer, The Golden Boys, The Beach Boys, and Of Montreal. (I'd also add some friends to Tilapia.) We'd do "Upon This Tidal Wave Of Young Blood." Clap Your Hands Say Yeah. It's our anthem for euphoria.